It was a little red billfold my Grandmama Norton gave me when I was eight that made me realize how special a gift personalized with a monogram can be. Each time I pulled my money out or, less frequently, put some money in, I noticed my shiny initials lined up in gold letters across the inside of my wallet: PFN — the initials that meant my name. They announced “This is mine.” And I was proud. When I was in high school, my mother gave me a monogrammed purse. Carrying it, I was always careful to turn my initials outward so everyone could see them. That was the year monogrammed shirts and sweaters were in fashion, too. I was especially glad my initials didn’t come together as a word. You would have to pity Penelope Inez Gunther! A middle initial beginning with a vowel can either work for or against you. Kitten-like Catherine Ann Tuggle had it made. Though these were my introductions to the charm of having one’s own initials placed on a personal possession, I have since learned that monogramming is not new. Also called service marks, monograms were originally placed on linens as a means of identification, and many household linens of the eighteenth and nineteenth centuries were numbered as well as marked with initials. Woven by hand, linen was a symbol of family wealth, more valued than furniture, silver, or jewelry. Linens were something to be cherished, used with care, and protected. You’ll find the rest of this essay, Why the Monogram Still Makes a Special Statement, on the Southern Lady website. Have you monogrammed any favorite possessions? I’d love to hear about it! When I was 6 years old my Aunt Lucy and also my godmother gave me a monogram charm for my new charm bracelet… It is monogrammed on a heart… I still have it and I cherish it! It was given to me when I made my first holy communion. I love monogrammed silver . I work in an antique shop and am constantly taking home monogrammed anything/any initials.i love thinking that everything has a story and that someone lovingly had that made for themselves. Thanks for the nice articles. Glad to know others out there have similar feelings about these wonderful things. I love monograms. When I was single in my 20’s and this was in the 1980’s – monograms were popular; however, I was very careful just to have my first initial monogramed on some of the items such as “button” purses, an umbrella, etc. in case I got married and my initials would change. I did get married and I still have some of those items; however, I don’t mind still wearing a silver cuff bracelet from that era that had all 3 of my initials. I remember when the photo of that cake was in the Celebrations magazine years ago. I used that article to guide me in a monogram shower that we did for a bride several years ago. 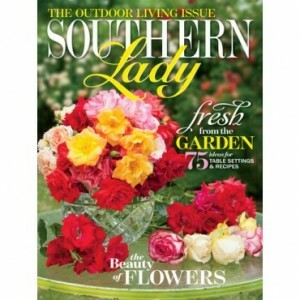 Thank you for all of the wonderful ideas in Southern Lady magazine (I keep all my issues) and also Celebration magazine. Years ago, I embroidered myself a chambray shirt with a “D” in a frame on the left shoulder. When my granddaughters saw it, they shouted, “look Nana has a “Lavern and Shirley” shirt. They had been watching the re-runs of the popular TV show. Needless to say, every girl in the family got a “Lavern and Shirley” shirt that Christmas. I’ve always adored monograms – still have a leather JRoman purse with brass letters punched through the leather – from early 70’s I think! Loved my initials D A Y! 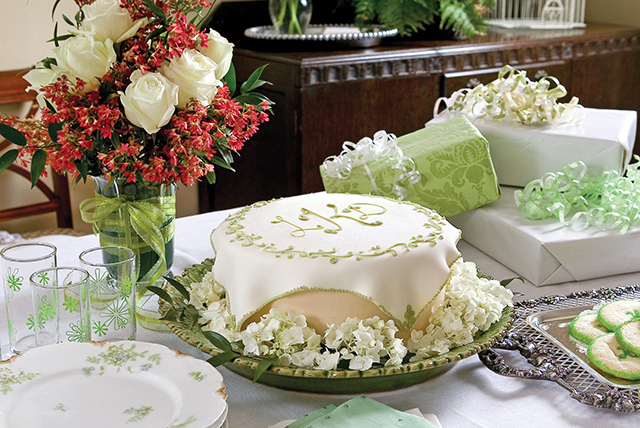 I love that special cake – monogrammed and lily of the valley — very special! I found pleasure in the beauty of those swirling L’s for the wedding and reception . Does anyone recall the popularity of the “Speidel” initialed bracelet of the 1970’s? I still have mine – yellow gold, shines as if brand new and monogrammed . It brings back sweet memories of a simpler time . Adore anything with a monogram ! TODAY I bought beautiful notecards bearing my initial of “B” for Baker . My Daughter and Son In Law’s Wedding cake had a gorgeous Swarovski Chrystal “L” sparkling atop for all to see . Hi Juli…I usually find my monogrammed note cards in specialty gift/stationary shops. I’m always on the look out for all kinds of special stationary. I guess you could probably have them made to order as well. I too love monogrammed items,such as note cards, linens and napkins that have been passed down to me from my grandparents. I also use a monogrammed handkerchief that my father brought back for me from Germany, and most recently my son’s girlfriend gave me a beautiful monogrammed lace book mark. I think the monogrammed cake is absolutely stunning, Phyllis! May I ask where you get your monogrammed notes? I enjoy sending monogrammed notes as well. On my 16th birthday my Mother and Father gave me a glove ring with my initials engraved on it. I turned 70 on December 24th, and I still wear that special ring. I’ve had to have gold added to the band a couple of times because it had worn so thin. I’ve had many people comment on how lovely a ring it is and I am always so very proud to tell them when and from whom I received it. I have a small tote with my monogram that my mother also gave to me; I guess mothers just know the importance of these things. Whenever I am linen hunting in antique stores, I always look for anything with beautiful embroidered initials. There are lots of “L”s at my house. Have a wonderful weekend. Yes monograms are so beautiful,on march 31th we were married 39 years and my husband gave me a very beautiful present. It was a little Frenche gold-bordeaux-red Ballroom purse from 1876 embroidered with gold metallic wire and thread on the front with flowers and on the back side it was also embroidered with the monograms A and P so lovely because these are my are initials. A from Anja and P from my maiden name Peters. It was still in his original box and also with a original letter dated January 6th 1876 about someone giving this purse to this lady who had also,received it as a gift. Its so very special to find this with the right initials and I feel also so very special that my husband found this very special present for me. It had been so nice to show the purse to your readers with a picture. I love all kind of antique things with monograms on it. Your post reminded me to use one of my monogrammed note cards for a thank you message to a very traditional friend today. It looks lovely, and I know she’ll appreciate it. Thanks.